UDA Estimating Templates include a complete library of construction estimating spreadsheets for builders, owners and contractors. Designed for residential and light commercial construction, and backed by an industry leader, these estimates include labor, materials, permits, insurance, clean-up, and over 1000 flexible categories. Already used by tens of thousands of construction professionals in 60 countries worldwide, UDA construction software delivers the new industry standard in project management for small to medium construction firms. With fully integrated and completely upgraded Estimating, Scheduling, Contracts, Specifications, and Document Management, UDA ConstructionSuite also includes over three hundred new features designed to give users total control over their projects. The foundation of your business success rests on accurate cost control. With an array of powerful construction estimating software tools, UDA Estimating enables you to develop comprehensive, accurate estimates for any residential, remodeling, or light commercial project. Take advantage of lump sum and detailed estimating methods, generate dynamic reports, and automatically launch job proposals with advanced UDA Estimating, or quickly create bids with UDA Summary Estimating. As a core component of the Construction Office system, UDA Estimating offers dynamic integration with UDA Scheduling and QuickBooks, making it easy for you to manage projects from start to finish. Take the UDA Estimating Video Tour. * Included in UDA Construction Office� QT versions. Know your Costs. Increase your Profits. Twice the work in half the time. Professionals who use construction estimating software can estimate for a typical project about 4 times faster than contractors who use basic spreadsheets or pen and paper. * Use UDA Estimating to quickly create professional, accurate estimates for all of your residential construction, remodeling, and light commercial construction projects. Plus, enjoy new CSI Estimating, based on the CSI MasterFormat. Reuse and repurpose data. When you use UDA Estimating with Construction Office as part of an integrated project management system, you'll discover that rethinking and retyping the same information is no longer necessary. UDA Construction Estimating software integrates with QuickBooks, UDA Scheduling, and UDA Document Management, making your estimating data more useful and more impactful as part of a total project management system. Based upon feedback from thousands of clients, UDA has designed construction estimating software engineered with advanced components and features for construction professionals. Detailed Estimating Tools allow for precise, accurate calculations of project estimates, lump sum and detailed estimating methods, sales tax calculation, percent margin or percent of costs margins, itemized materials lists, percentage change and optional QuickBooks Integration. Summary Estimating Tools are popular for quickly calculating preliminary estimates from schematic plans or preparing a project quote. Plus, with over 15 Sample Projects preprogrammed with national average construction costs, you can dramatically reduce your estimating time with baseline cost figures for a variety of project types. 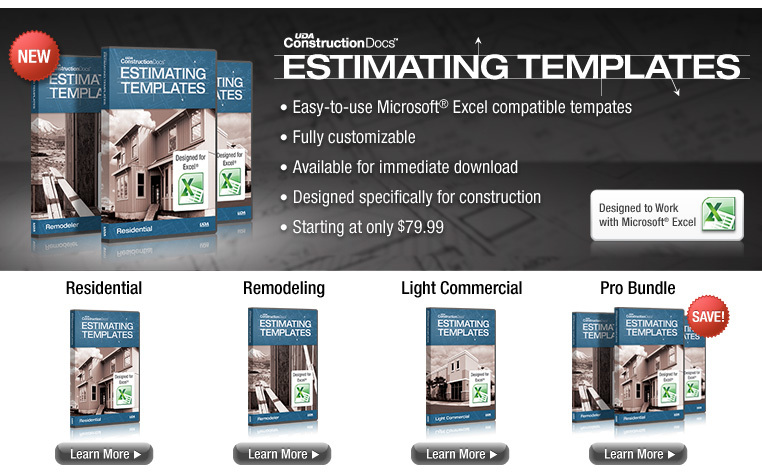 If you're like most of us, you don't have weeks to learn new construction estimating software. UDA estimating tools are designed to quickly and accurately produce detailed cost estimates suitable for Preliminary Budgeting, Project Quotes, or obtaining Construction Loans. And because UDA Estimating works seamlessly with the leading spreadsheet application Microsoft Excel, you can immediately enjoy its powerful capabilities. UDA is proud to announce new status as a Premier Member of the Intuit Developer Network. "We are thrilled that UDA Technologies is participating in the Intuit Developer Network and is enabling data sharing between UDA Construction Office and the QuickBooks products," said Mark Bercow, vice president of the Intuit Developer Network. "Our relationship with UDA Technologies will help us better meet the specific industry needs of our small business customers." UDA currently offers the broadest range of construction estimating software solutions designed for QuickBooks, all targeted specifically for small and medium sized firms who need to leverage the power of QuickBooks to build sales, build efficiently and build their businesses. Learn which Construction Office� Suite best meets your needs. Download the UDA Construction Office Trial. Be a power user. UDA Estimating includes advanced estimating features designed to give maximize power and flexibility so you can customize estimates to fit your needs. Use advanced UDA Construction Estimating to create detailed, accurate estimates with powerful capabilities like lump sum or detailed estimating methods, city, county, and state sales tax, percent margin or percent of costs margins, itemized materials lists, custom units, and percentage change. UDA Construction Office� features both summary and detailed construction estimating software tools preprogrammed with national average construction costs. Summary Estimating Tools are ideal for square-footage based estimates or quickly calculating preliminary estimates from schematic plans. See what real clients say about UDA Construction Office� and UDA Estimating. Explore how UDA Project Solutions Outlines can solve contruction management needs for different types of projects. See how easy it is to use Construction Office. Review UDA Web Help for the latest step-by step instructions, troubleshooting, and FAQ's for how to use Construction Office. Help us help you by submitting questions or suggestions about current or future UDA products. UDA Construction Office is designed as a companion product for Microsoft Office to provide the Construction Management software necessary to successfully tackle any project, including: Planning, Design, Estimating, Bidding, Scheduling, Contracting, and Project Management. Used by thousands of Builders, Individuals and Professionals, UDA Construction Office Software is your comprehensive solution for Construction Management tools. Newly updated Construction Office now includes a comprehensive library of Construction Contracts, Forms, Specifications, Worksheets and Templates designed to accomplish everyday tasks more efficiently. Whether you are working on 1 or 100 projects, UDA Construction Office provides the Construction Management tools you need to succeed. UDA clients range from Fortune 100 member Marriott, the world's leading hospitality company, with 21 brands including: Ritz-Carlton, Marriott, Renaissance, Courtyard, Fairfield Inn, Ramada and Residence Inn, to tens of thousands of successful Construction Professionals across North America and 60 countries worldwide. "I have worked with numerous Architectural and Design/Build Firms and have had the opportunity to attend construction software conventions and seminars... comparatively your estimating components have better quality and price than any I've seen... "
"I recently purchased the QuickBooks version of Construction Office Professional and am really pleased with the UDA QuickBooks Integration... I've used QuickBooks for years and feel that this will really work well for me. I was pleased that your construction estimating software was based in Microsoft Excel, I've been estimating with Excel for years and once I saw what you had, I wished I had found you 10 years ago!...Thanks"
"... I believe the reason we got the job was from being so well prepared for the bid by using UDA Estimating and Documents (Construction Office Professional California with QuickBooks Integration)... "